Two more people have been arrested after a man was injured with what police believe may have been a firearm. 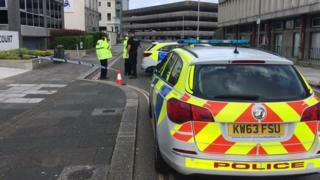 The 27-year-old victim suffered an injury to his arm - which is not thought to be life-threatening - in the early hours of Saturday on Princess Street, Plymouth. Two men have been arrested on suspicion of attempted murder, robbery and possession of a firearm. It comes after a woman, 27, was held on suspicion of attempted murder. All three remain in police custody. Det Insp Dave Eames, said: "Further arrests have now been made and we are still of the belief that this matter is an isolated incident involving people who know one another. "There will continue to be a police presence in the area and we would still like to hear from anybody who was in the area during the incident."